Throwback Thursday is a weekly meme hosted by this site where we pick one of our favorite books from our childhood. 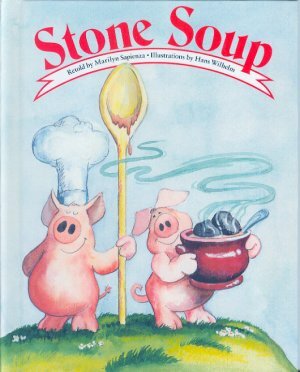 This week, I've chosen Stone Soup. From the author - Delightful retelling of the famous folk tale with pigs as the hungry travelers and other animals as the villagers. "Three soldiers are returning home from war and are looking for a warm meal and a place to sleep. The soldiers ask the peasants for a bite to eat and a loft to sleep in, however, just before the soldiers arrive the townspeople hid all of their food because they said they hardly had enough for themselves. Since the soldiers are hungry and the people will not give them food, they get the entire town to help them make "stone soup." As the book progresses, each of the ingredients are added to the soup and the townspeople bring their food out to add to the pot. The story ends with the town (and soldiers) enjoying the soup and dancing into the night. Finally, the soldiers are given a place to sleep and the next day, the town sends them off with a warm goodbye." I always loved when my mom read this story because it had animals as people and that was really cool to me. This is a great book for kids because it's a fun read and it teaches the lessen that if people work together and share, everyone wins.